The possibilities are endless. The Emma leather flower harness is a beauty, accented with the sparkle from genuine Swarovski crystals. 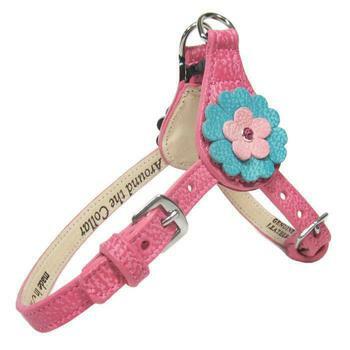 Features a leather Emma flower on both sides on this harness. Lined with fine quality leather, hand painted on the edges and stitched to match your leathers' color. Swarovski crystals are handset in the center of each flower to ensure durability. 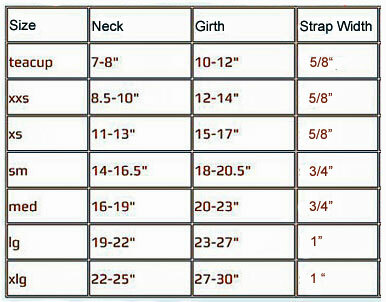 Straps are adjustable to provide a secure and comfortable fit. Once your straps are adjusted to your pet's size you will only need to use the side release buckle that opens and closes on their back near the neck. Each harness has a nickel O-ring on the strap loop to attach ID tags and nickel buckles. You select your choice of leather strap color, top and bottom flower color, and Swarovski crystal.